I love Disneyland. Just ask anybody who knows me. I can't get enough of that place. I also love Disneyland Resort restaurants and snack carts. Their food and snacks are just magical. 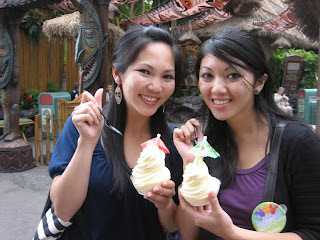 Therefore, I decided to share with you some of my favorite from Disneyland, starting with the famous Dole pineapple whip. I was first introduced to this by my best friend Linda. I love pineapple, but sometimes pineapple flavoring can be a bit overwhelming. This was why I was hesitant to stand in this tremendously long line for some "frozen yogurt". After my first try, I knew it was worth the wait. The Dole whip only cost a mere $3.03 and I can never finish one by myself. It taste exactly like a pineapple, not pineapple flavoring. I haven't tried the pineapple float, but I might have to.... one day. Seems to be a lot of pineapple in one cup. Tip: Located in front of the Tiki Room attraction, there are two lines for this stand: one that wraps around the front of the stand and another through the Tiki room entrance. You can stand in either line, even the one inside the Tiki Room entrance. 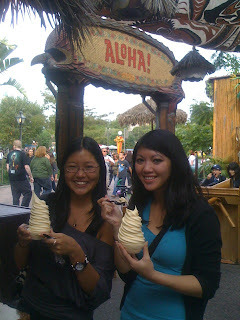 Apparently, this Dole pineapple whip is only available in one other location: the Dole pineapple plantation in Hawaii. So if you are in the park and feel the need to have a cold snack, give the whip a try! Stay tune for the next yummy Disneyland Resort treat! Not sure which one I'll feature yet... I'll have to dig around in my photo albums for past food photos. Actually, I have a much better idea: I think I'll head to the park this week and *make* myself try some of food there... you know, all for blogging purposes!